Is this the first Blackwing Volumes Pencil that I don't like? I took a while to get to this review....and in fact, I almost didn't write it. I love Blackwing pencils as they were the reason I got back into wood case pencils. And this is the first Blackwing Volumes release with which I have had problems. My question was whether to say anything or keep quiet? The point of a review is to point out the facts, even when they are not favourable. 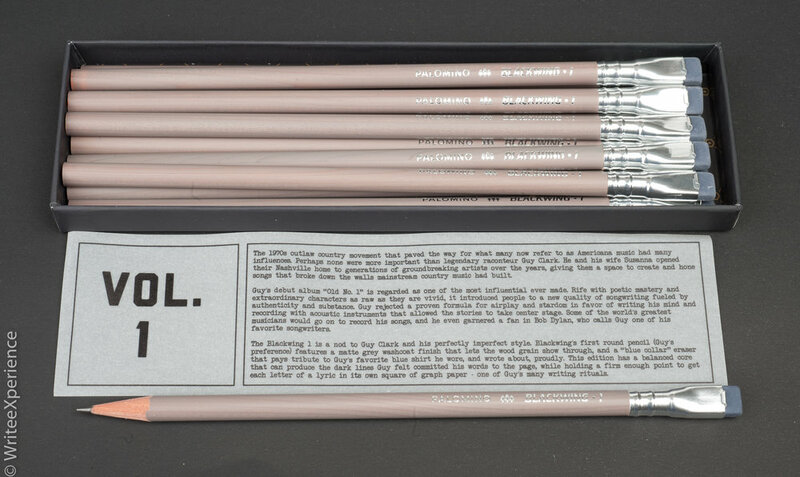 And so, I revisited my box of Blackwing Volume 1’s to bring some fair criticism to my favourite pencil product line. Why do I not like this pencil? Not because of the design, though this does factor into it. But because my samples had quality issues that were disappointing to me. I noticed the problems with the pencil immediately. As always, I eagerly opened my new box of Blackwing pencils but quickly found that the printing was not lined up with the centre of the ferrule on almost half of the pencils in the box. And this bothered me, to the point where I closed the box and pushed it to one side of my desk, where it sat, unloved for the last six weeks or so. When my current favourite pencil (the beautiful Blackwing Volume 73) became too short for me to use comfortably, I chose to revisit the Volume 1 and share my thoughts. Blackwing set the bar very high by naming this release Volume 1. 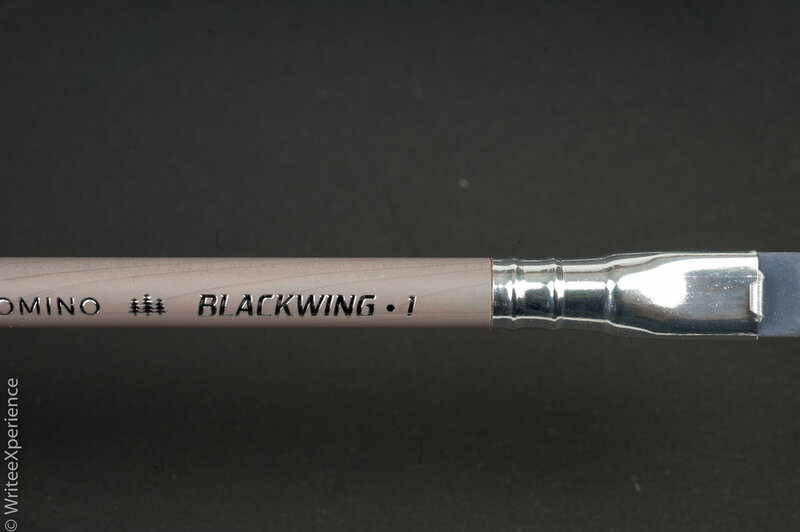 I expected this to be the best Blackwing to date, because of the prominent number. Blackwing numbered this volume for Guy Clark. Haven't heard of him? Me neither! But some Googling shows he was a famous pioneer of outlaw country music in the Nashville area in the 1970s. Is a tribute to Mr. Clark worthy of the lofty Number 1 moniker? As a non-country music fan, I have a hard time saying so and guess that the number is debatable, but it does tie into Clarke’s debut album “Old No. 1", which is the internet reports as the most influential album of his career. I previewed his music on iTunes and couldn’t bring myself to hit purchase, so I believe you have to appreciate country music much more than I do to enjoy the numbering. The design of the Volume 1 pencil is very nice. This is the first round barrel pencil that Blackwing has produced. The barrel colour is a semi-transparent grey finish, and this looks much better in person; the pictures I have seen on the internet show the natural wood colour seeping through the grey finish leading to a dull beige shade. One comparison likened the colour to those beige orthopaedic shoes that seniors often wear, and from the initial online pictures, I feel there was some truth behind the joke. In person, the colour is more grey, though still shows the wood undertone, and is a lot nicer than some pictures would have you believe. The ferrule is silver with a "blue collar" eraser that looks dark grey in my pencils. In fact, it wasn't until I was researching Guy Clark that I realized the eraser was supposed to be blue! I compared the eraser to the blue Volume 56 and a standard black Blackwing eraser, and I could see a bit of blue colour, but it still is a grey eraser to my eyes. 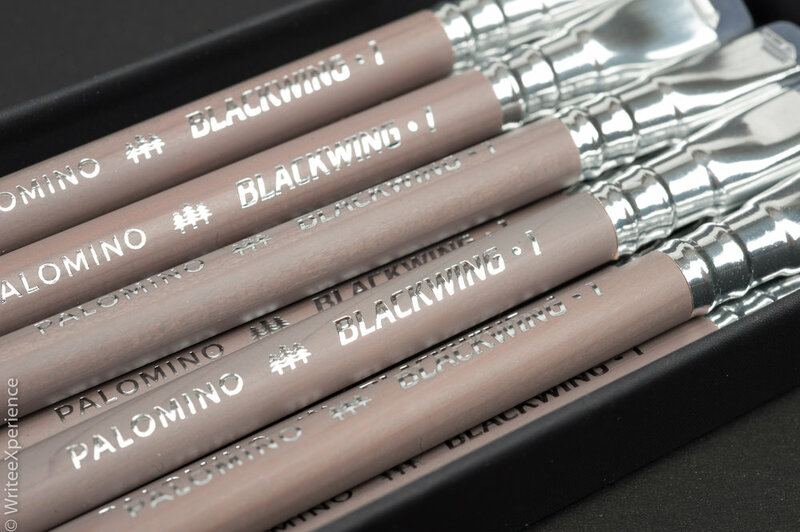 The logo printing is a lovely, shiny chrome logo with the familiar Palomino Blackwing branding and the cedars logo. Unfortunately, it is this branding that is a problem on many of the pencils I have. On almost half of the pencils in my box, the branding print was misaligned with the centre of the ferrule. And this misalignment bothered me. To the point that I didn't want to look at these pencils and they went back in the box. I have experience in the manufacturing sector, and so I do understand why misalignment of a round pencil with an elongated ferrule can happen in a production environment. Given the unique design of this pencil, a unique problem is aligning the round pre-printed pencil and Blackwing ferrule as there is no definite alignment point, such as hex flats on the pencil. Alignment is irrelevant to most pencil production. After all, if you have a round ferrule, it doesn't matter with which rotation it goes on the pencil. But for someone like me, who straightens up uneven pictures as I walk past and habitually turn off lights left on (and with a teenager in the house, I do this a lot), the inconsistently offset printing was disheartening and uncomfortable for me. My problems with quality didn’t end there. I also discovered that this finish seems to crack or peel away from the point in uneven layers when I sharpened the pencil. I sharpened the pencil using Blackwing’s Long Point pencil sharpener, and the problem continues, even as I expose more wood from continued sharpening. The graphite in this pencil is the same as that in the Blackwing Pearl - which is the middle hardness lead offered in the Blackwing line. Lines are dark and writing is smooth. As I have been writing recently with the even softer Volume 73, the point on this pencil lasts longer than I expected, but it is still quite soft - around a 3b hardness. Point retention is appropriate to a graphite of that softness. As mentioned, this pencil is round. Round pencil barrels are a change as I usually use hex pencils, but this as quite comfortable. Unfortunately, the finish is a slippery for prolonged writing for me as I find my grip sliding towards the tip of the pencil as I write. The slipperiness may be due to my grip, but this doesn't happen with regular Blackwing pencils. On my samples that have the writing aligned with the ferrule, this is a beautiful pencil. However, the quality issues and the slippery coating make this my least favourite Blackwing Volume so far. And that is disappointing for a pencil with such a significant number!